Four high-rise buildings will be built on the site and will form a new, urban quarter. Two of the towers are planned for living space, with other areas for catering and retail. Due to the special location in the middle of the skyline – also adjacent to the shopping and pedestrian zones of the city centre – the project has the potential to create a unique form of cosmopolitan urbanity in Germany. This is the result of the urban development competition which the owner of the site, the Groß Partner, Grundstücksentwicklungsgesellschaft mbH won in November 2015. This project has special architectural significance because of the planned 228-meter-high main tower in the district. 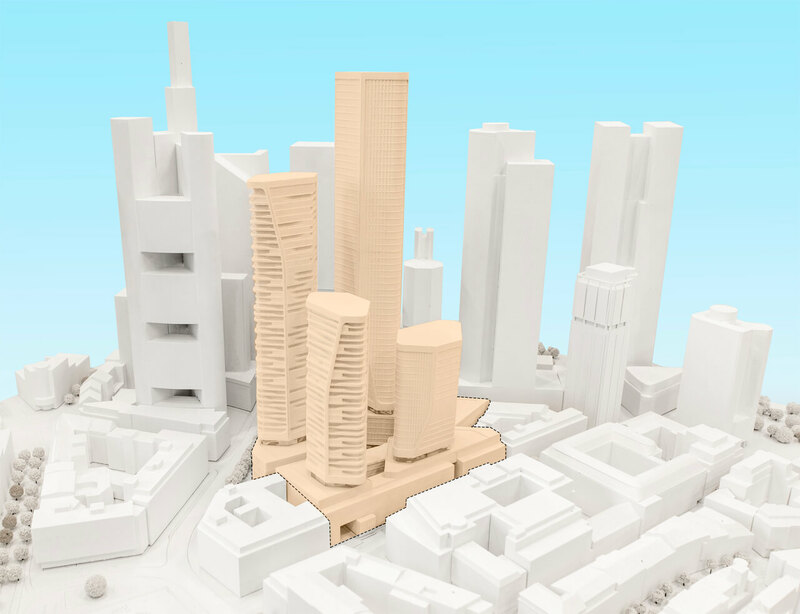 In the immediate vicinity of the Commerzbank Tower and the Maintower, a new high-rise building with 59 floors will be a further addition to the Frankfurt skyline, with the potential to enrich the high-rise area as another landmark. This tower is already outlined in the current development plan. The two residential buildings are new, and together will provide space for more than 600 apartments. In addition, there will be a children’s playground, two hotels and a wide range of restaurants and shops.